Holi popularly known as the festival of colors. This is one of the most enjoyable Hindu festivals only next to Deepavali which is played with equally high spirits and enthusiasm. This is a festival celebrated in North but the culture of playing Holi gradually spread to Southern states as well. However, a similar festival named Vasantotsavam is celebrated in South which is just playing with natural, eco-friendly, herbal color waters. The festival is celebrated on the full moon day in the Hindu month of Phalgun which usually falls in the month of March. It is a 2-day festival. The day before Phalguna Pournami is celebrated as Choti Holi. On this day, people set bonfire and celebrate Holika Dahan (known by the name Kama Dahanam in Southern states). On the 2nd day i.e on Phalguna Pournami day, Holi is celebrated. This is known by the name Dhulendi in some regions. The festival of colors has much of social / cultural significance than religious. 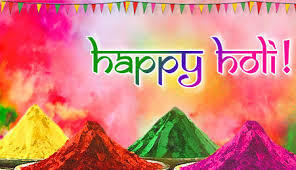 The Northern states of India which will experience cold and foggy winter till February, rejoice the onset of colorful spring by celebrated the colorful festival of Holi. It is a festival of joy that reunites several broken relationships. According to legends, Holika who was the sister of the cruel demon king Hiranyakaship was burnt to ashes on this day. To commemorate the same, people in the North set bonfire called Holika Dahan. While people in South believe that on this day Lord Shiva opened His third eye and burnt Kama Deva to ashes In Hindu mythology, Kamadeva is considered as the god of love. Hence, the bonfire set on Holi is known as Kama Dahan. It is believed that Lord Krishna used to play and enjoy the festival along with Radha (an imaginary character considered as the beloved of Lord Krishna) and gopikas (the milk maids). Holi is celebrated with high spirits by the people in the Northern states. The main celebration is playing with colors, both color powder and color water. In the recent years chemical colors are being extensively used for playing Holi. These colors pose threat to the human health and to the environment too. People just forget everything and immerse themselves in full enjoyment. Children enjoy playing with pichkaris and throwing balloons filled with water colors, on each other. People of all age groups irrespective of gender get fully drenched in colorful waters. Smear or throw color powders on each other and enjoy to the peak. The enjoyment reaches its culmination with the intake of Bhang which has become synonymous with Holi. Bhang is an intoxicating liquid extract of Cannabis which is taken raw. The popularity of celebrating Holi and consuming bhang might have been gained from Bollywood films. It's time to know the harmful effects of using synthetic / chemical colors in Holi. Play and enjoy a safe and environment-friendly Holi. Save the environment from polluting further. Stop using chemical colors and start using natural colors for playing Holi. Enjoy a harmless play of colors. Protect your skin and hair from the harmful effects of chemical colors. Natural colors are available in the market and these can even be made at home easily. Mostly plants and plant products are used for making natural colors at home for which many of the colorful flowers like hibiscus, marigold, chrysanthemum, Flame of the Forest, rose petals, Jacaranda, henna and the like can be dried in the shade and then ground to a fine powder to obtain colorful dry powders. Extracts / juices like beetroot juice, tomato juice, carrot juice, spinach extract, coriander leaves extract and the like can be mixed in water and can be used as water colors. Use of such natural colors while playing Holi is safe to the human health and to the environment. It is very much beneficial for the health of humans as many of these natural plant products have medicinal value.